Son Soreno - an elegant and secluded 116 acre contemporary estate located in the wine country of the beautiful Santa Ynez Valley. 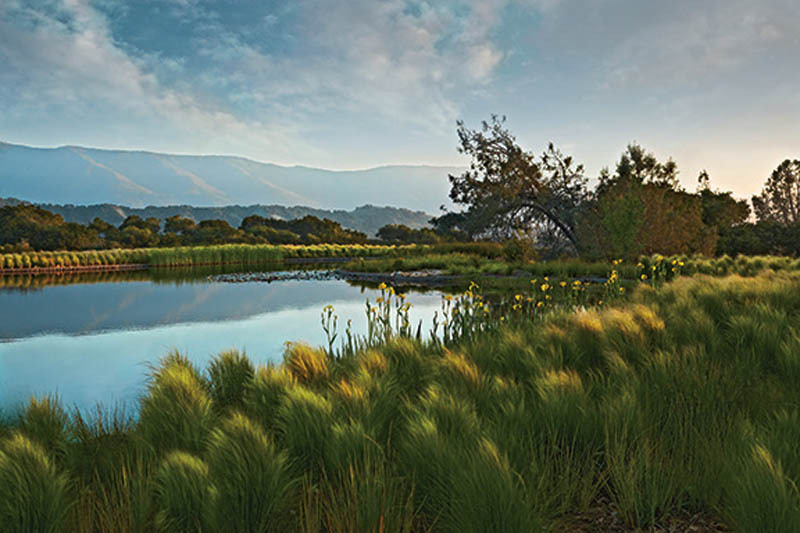 Known for its bucolic scenery, equestrian farms, vineyards, and quality of life, Santa Ynez is a short drive from Santa Barbara and only 2 hours from Los Angeles. Award winning architect Michael Palladino, best known for his work at The Getty Center in Los Angeles, was commissioned to create a sophisticated, contemporary estate in keeping with the materials, colors and context of the natural landscape. The estate is characterized by the harmonious scale of its rooms in a layout that provides both privacy and inviting social spaces – all suffused with natural light from windows designed to frame the spectacular views. The result is a sophisticated house grounded in the western architectural vernacular that exemplifies modernist principles of form following function. The custom designed curved ceiling of the living, dining and family rooms is shaped as a wave from 14 feet at the highest point ending in clear-story windows. Floor-to-ceiling windows along the galleria capture the long views to create a wall of scenery with forms and colors not unlike a painting. The formal dining room opens to a west side verandah. The home's design was twofold - architecture comfortable to live in, and architecture as art. The gracious chef's kitchen features a large cooking island, walk in commercial grade refrigerator, butler's pantry or prep kitchen, informal dining area and outdoor deck. An adjacent family room with wood burning fireplace opens to an outdoor dining space with built in barbecue. The additional parcel features a spectacular lake, comprised of nearly one-half acre of pristine water from a dedicated well, with a beautiful surrounding landscape and views. ...with heavenly views through floor-to-ceiling and clear-story windows, providing exceptional indirect light. The master bath connects to both bedrooms, and includes dual walk-in closets. A tranquil master suite sitting room, part office part media/reading space, includes a cozy wood-burning fireplace. ...as well as a grand library galleria. A lower level guest suite includes a bedroom, bath and separate sitting room that opens to the pool. A gym and two bedroom suites with separate entry complete the home's lower level. In addition to oaks and sycamores, a large olive orchard leads up to and surrounds the house and extensive grounds, in which drought tolerant Mediterranean and native plants give way to the refinement of roses and lawn in the gardens. Outside, a solar-heated salt water pool, pergola and separate bath are perfect for recreation or leisure. The estate’s horse facilities include an eight stall, center-aisle barn set away from the main home, fully equipped with a bathing and grooming area, tack room, laundry room and bath. The property also boasts private wells for both the main house and the barn. A large hay and equipment barn, arena, track, paddocks, irrigated pastures and a three bedroom ranch manager’s home complete the extensive equestrian facilities. Located in coveted Happy Canyon, known for its quality wine production, this 116 acre estate has vineyard potential. The potential for a combined 218 acre estate, offered at $15,900,000, brings together an elegant, secluded and unique opportunity within the Happy Canyon wine country of the beautiful Santa Ynez Valley.